I think you'll laugh at this one. 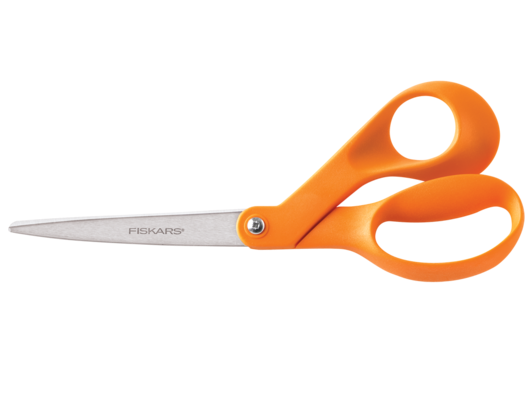 But I really miss my old orange handled Fiskar nice scissors. Apparently I'm not the only one who likes them, as they're called 'The Original Orange-Handled Scissors' on their website :) I'm almost inclined to ask for a couple pairs, so I don't find myself without them for so long again. These were the scissors that my mom kept from us so many years ago, because they were her good 'sewing scissors.' Sometimes I snuck them for important projects anyway, because they cut so much better than the other ones in the drawer for our use. Lately I've been reduced to using our scissors in our knife block for everything, since my favorite Fiskars walked away. Although I'm sure as soon as I finally get a new pair, they'll come back again. Doesn't it always go that way? I now have fiskars in the kitchen drawer and in the sewing room. I also use the knife block scissors for everything. You don't have to open a drawer of anything... just grab and cut.